The real truths of politics, governance and economics (here). Labour’s 10 great achievements (here). I could stick another one up. Socialism invades and steals land that the free market has carved out. As a humble example Slimming World and WeightWatchers have been helping people who want to take responsibility for their own health for decades, and their customers are paying 20% VAT to the government for that privilege. Along comes socialism and wrecks all of this by running NHS Health Improvement Programmes that take people with clinical skills out of their normal workplace to lecture people on how to live, when those of us who have decided we want that weekly pep talk on our diet and exercise from the free market are already paying for it thank you very much. So the typically low income participant in personal health responsibility is paying twice, once for their own benefit, and once for the government’s benefit to spout the same but less effectively as the government programmes have been shown to be. You are talking about Communism! Bernie is talking about Democratic Socialism, just like our Constitution is based on People over politics. You are doing a tremendous diservice to our Nation. Bruce = From the other Bruce. 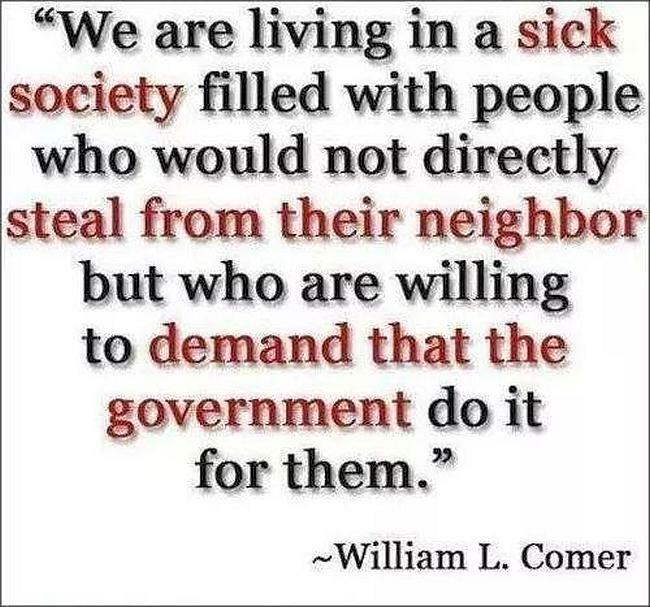 Communism and socialism are the same. The Soviet Union was the USSR. The Union of Soviet Socialist Republics. What a churlish and pointless comment. How moderate socialism and communism could be called the same is absurd. I suppose national socialism is also communism, as it has socialism in it’s name as well, despite it equating to fascism. I suppose moderate conservatism and libertarianism are one and the same too? You strive to be libertarian but defend only conservative views, despite them readily going against what you believe in. Typical partizan thinking. You needn’t run out of other peoples money, simply take more of it. Sound stupid? Yes, about as stupid as the concept that socialism isn’t run on basic economic principles in the same way a conservative or other economic policy might be run. Such a puerile comment shouldn’t be allowed to remain in circulation let alone reduced to meme format. You really don’t understand even basic economics. You quite clearly do not understand socialism because socialism works differently to ‘basic economics’ and to suggest otherwise shows an ignorance of the subject. That’s the thing. 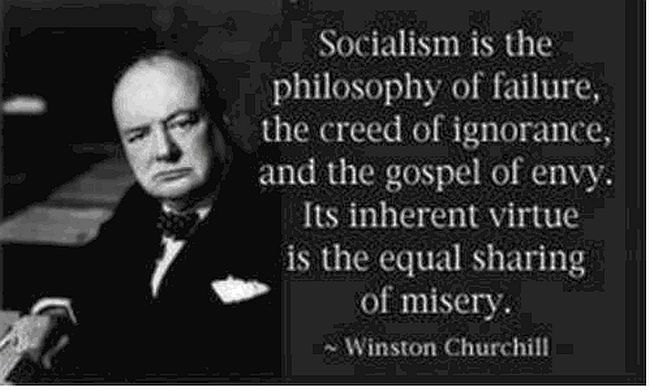 Socialism doesn’t work, never has and never will. How about you try and explain, if it so simple, rather than just use an elitist put down to try and fob off any speculation that goes against your beliefs. If you do, try to not use any memes, or erroneous graphs. They just discredit your argument. It would take too long for me to teach you economics. WInston Churchill was a failure for 40 years after the Gallipoli debacle. He suffered from cyclothymic depression and was treated as a headline grabber and with suspicion. He wasn’t even a proper Churchill and his surname Spencer was changed for closer association to his ancestor. He had a fixation with the “underbelly of Europe” and never learned any lessons. He opposed D Day and tried to undermine the Americans. He was Imperialist at a time when the Empire was in its closing scenes. He was a radical who did not believe in liberty unless it was in his own interests. Margaret Thatcher tried to model herself on this personna. So I ask the question, as a non socialist and apolitical individual who cannot find anything good to say about any politicians. If socialism is an evil, how could it have been created? Surely its origins are to be found in abject poverty and exploitation of populations who have no other voice? I would argue that if Life was Fair and collective responsibility was a reality socialism would be irrelevant. You are advocating an American Republicanism where freedom is individual rather than collective. This is unworkable as such individual freedom interferes with the individual freedom of another. This makes democracy and Nationhood impossible. Your statements of rhetoric have no place nor relevance in a society based on cooperation. 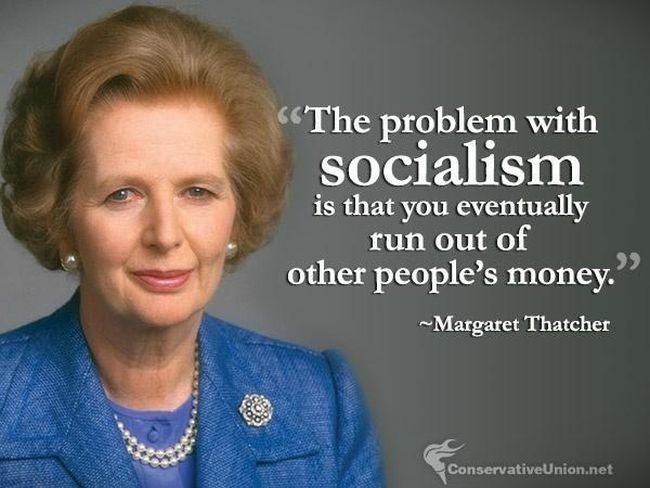 But there again Margaret Thatcher didn’t believe in Society. She was another who was wrong about everything. The success of “Thatcher’s Children” is now being paid for by a generation which has lost its soul. Just take time to think about this before the usual radical knee jerk response. In other words stop being a jerk. Did you get this childish and vapid nonsense from a ‘Dummies guide to why Socialism is bad’? Or do you genuinely think this constitutes in depth analysis? Here is the pyramid of intellect. I will let you work out for yourself where you sit on it. That is not a response, that is a ‘meme’ that does not constitute any mythical ‘pyramid of intellect’ at all. What you wrote is childish, in that it shows no nuance or subtlety, and it is vapid, as it is a surface level analysis of something more complex than you seem to understand. And considering you’ve spent the last day or so calling Diane Abbott MP ‘fat’ and ‘ugly’ on Twitter because you disagree with her, who is it who resorts to ad hominem out of the two of us? The pyramid of intellect is known technically as Graham’s Hierarchy of Disagreement. Also you don’t seem to understand that it is about REPLY. Whether or not it’s about reply, that does not then give you licence to preach to others about their conduct when you resort to caking Diane Abbott MP ugly and comparing her to a pig. A case of practice what you preach, no? In any case, my central point is that if you’re going to critique socialism, then it may be wise to offer more depth than the one-sided attack you’re putting out here, it weakens your argument. There has to be a balance between individual dominance and collective dominance when people interact to create social and political structures. Communism and it’s close relation Socialism champion the collective . Classic liberal and Conservative champion the freedom of the individual. The dichotomy is difficult to reconcile. A free society where the individual dominates but not completely seems to create the most popular and human choice . That said there will always be the less fortunate to itch the conscience . The monolithic soviet socialist model is as elitist as a conservative oligarchy , thus it’s failure.